Jermaine Ollivierre (b. Philadelphia, PA) received his AFA at Delaware County Community College (2011-13), studied Painting and Sculpture at Tyler School of Art (2015-17). Ollivierre’s work has been exhibited at Tyler School of Art, Delaware County Community College, City Hall’s Creative Philadelphia, Conception Gallery, Long Island, NY, in public spaces in North Philadelphia, and in various SEPTA transits locations from North to West Philadelphia (Market Frankford and Broad Street Lines). Jermaine lives and works in Philadelphia. I grapple, challenge, defend, dissect, and exploit the misunderstood complexities of identity in my work. The disparity within specific local, urban, rural, and suburban landscapes feed my practice. I use my privileged, and underprivileged situations of my lived experience as the artistic medium, to aid my insatiable appetite for truth. Unfinished in-progress choices in my sculptures mirror the never ending investigation on the self, and serve as a function, tapping into human condition. I intentionally use autobiographical experiences as my source material which expose my internal struggles. This process of peeling away societal influences and norms reveals uncomfortable truths, which continue to further my inquiry into the human psyche. The false, vague, and misleading ideals of liberties, infiltrating my upbringing, grooming me for a problematic journey in life; I have to revisit moments of my childhood to redefine, reshape and rebuild myself. 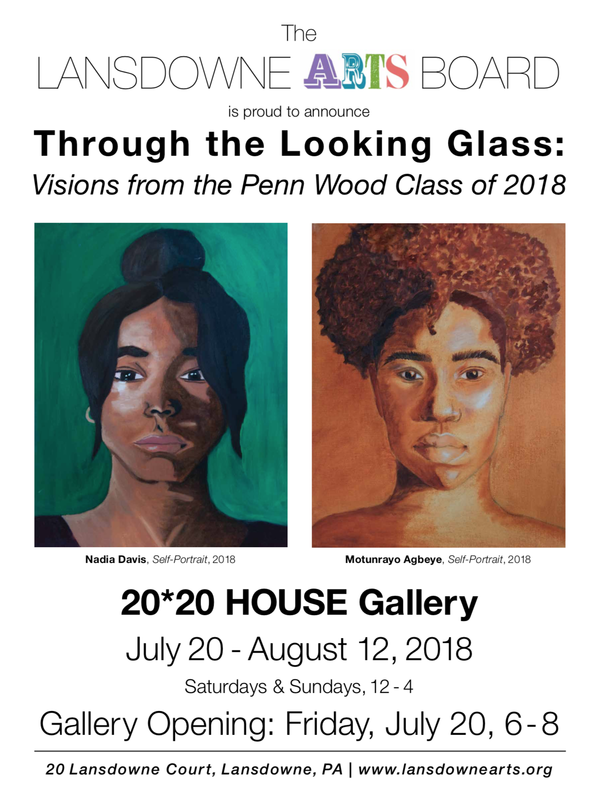 Through the Looking Glass: Vision from the Penn Wood Class of 2018 features artwork in oil painting, ceramics, drawing, and sculpture of nearly 20 of our local community’s most talented high school seniors. Serving on behalf of the Lansdowne Borough Council, the Arts Board is pleased to showcase the work of these gifted students. The students whose work will be featured in Through the Looking Glass are Motunrayo Agbeye, Jestina Bao, Pewu Besson, Azar Clarkson, Nadiah Davis, Vickiana Dulcio, Martha Freeman, Danaé Holmes, Tymara Jones-Love, Jazmine Lane, Hosni El Myatt-Knox, Ixchele Ortiz, Imani Medina, Taléna Mitchell, Dynesha Robinson, Myles Smith, Kiera Stevens, and Kelly Young. The students include several members of the National Art Honor Society and National Honor Society; an artist who received an Emerging Artist Award from the Pennsylvania Academy of the Fine Arts; students who have had work exhibited in the Tyler School of Art Clay Programs of Excellence in Philadelphia Area High Schools Exhibit and in the Delaware County Community College Annual Regional High School Art Exhibition; and students who have had their work judged by and awarded at the Penn Wood Annual Juried Art Show by noted professional artists. They worked under the direction of Penn Wood High School Art Teachers Kay Lord and Alyce Grunt, and the exhibit would not have been possible without Lord’s and Grunt’s assistance.